See that little arrow before the title? That means a mod or guru has moved it. So they are active on the Mac forums but choosing not to post or offer advice and help. A mod has moved it to bring it to the attention of the gurus so it is deleted. In the hope that the Sims fanboys will report my posts, thus earning me a ban. In the hope that the fanboys will post positive reviews on the Customer Service Scoreboard website hoping to balance out the 155 negative comments versus 13 positive ones. 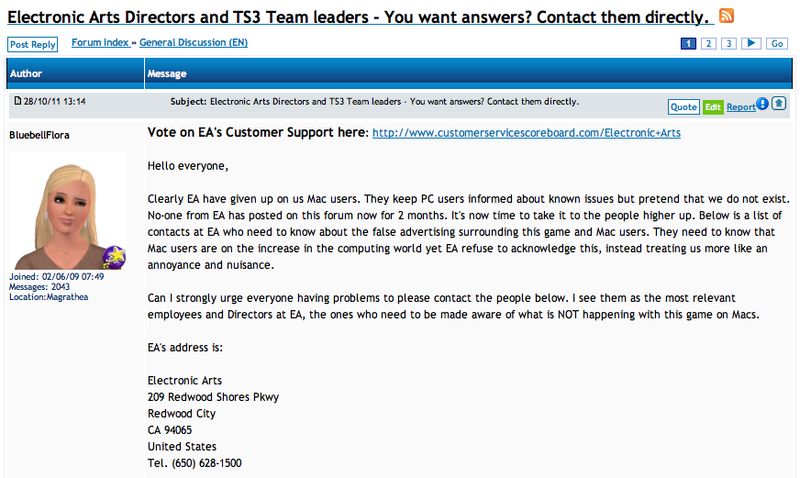 Either way the bait was taken, proof that they are reading the Mac forum but choosing not to bother helping Mac users. Previous 17 hours to go! I have no intention of getting TS4, TS3 will be the last EA game, not after all this crap. 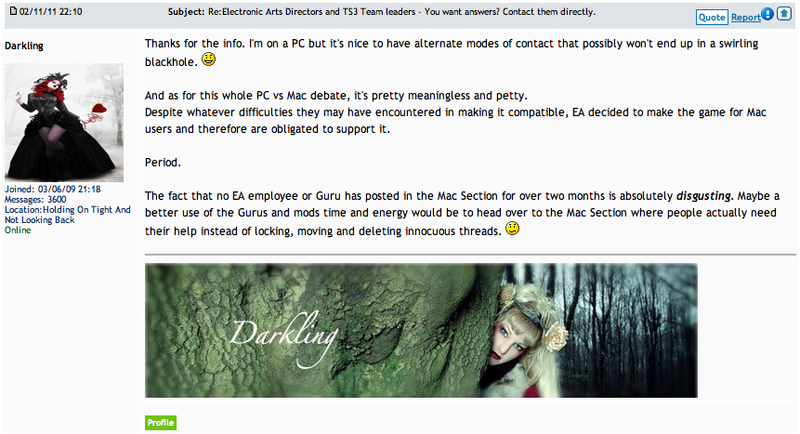 That’s a truly excellent post by Darkling, it really sums up the situation for Mac and PC players alike. I forgot to say, if you don’t buy TS4 (assuming they actually make such a thing), I for one will miss your builds! My sim is currently living very happily in a washed out shack, although he covets the beach huts next door. The thread is still there, I thought for sure it would have been deleted by now. Nice to see that there are so many supportive Windows users out there 😀 Darkling’s got a good head on her shoulders, you can always count on her to put things in perspective. The Sims 4? I don’t even want to think about that disaster waiting to happen.